Our free Email Forwarding feature allows you to create personalized email addresses for a domain and forward emails to other email addresses of your choice. This service is available for all domains pointed to our BasicDNS, BackupDNS (a legacy option), PremiumDNS or FreeDNS systems. It is possible to create up to 100 forwarding email addresses on our BasicDNS, PremiumDNS and FreeDNS name servers, and up to 50 forwarding email addresses on our BackupDNS system. This is an email forwarding service that does not allow creating fully-featured email accounts and send outgoing emails from address@yourdomain.tld, since it’s a virtual email address. You may consider our Private Email service, which allows creating such an email account. 1. Sign into your Namecheap account (The Sign In option is available in the top hat of the page). NOTE: The SPF record shown in the screenshot above is needed for free email forwarding to function, thus, it cannot be deleted. Once MX records are set, you need to create your forwarding email addresses. 6. Fill in both the Alias and Forward to fields with the corresponding information and click on the checkmark icon to save the changes. Alias is the name of your forwarding mailbox. 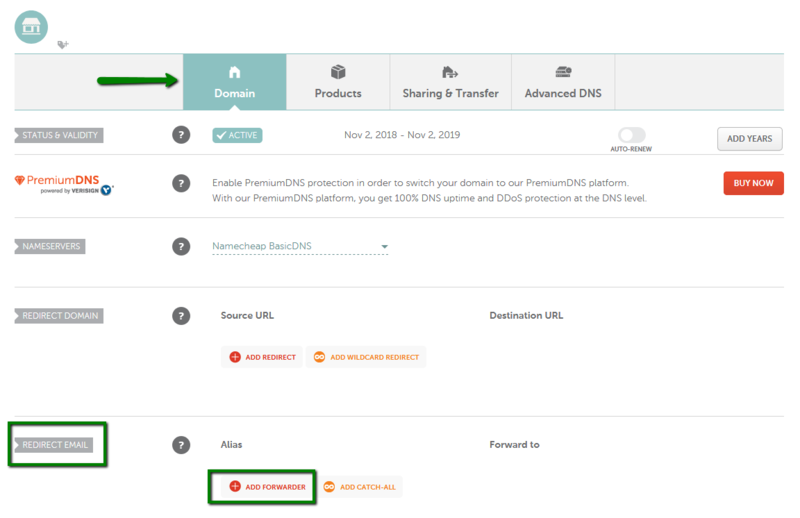 For example, if you are forwarding all emails sent to admin@yourdomain.tld to your destination email address, you will need to put admin in the Alias field (it is also possible to forward the same alias to several email addresses). Make sure that the Forward to field contains your full destination email address as well. Please allow about an hour for newly created mailboxes to be completely set up on the forwarding mail server. After your settings have been activated, you will be able to test your mail service. NOTE 1: Delivery of test emails sent from the same email address that is set as Forwarded to will most likely fail. Thus, please use another email address when testing the email forwarding service. NOTE 2: Emails that contain a .zip attachment are automatically blocked by the Free Email Forwarding spam filter. Such emails will not be forwarded to the email address that is set as Forwarded to.